So recently, I tried to combine Flexible and Elastic Asset Allocation. The operative word being–tried. Essentially, I saw Flexible Asset Allocation as an incomplete algorithm — namely that although it was an excellent method for selecting securities, that there had to have been a better way to weigh stocks than a naive equal-weight scheme. It turns out, the methods outlined in Elastic Asset Allocation weren’t doing the trick (that is, a four month cumulative return raised to the return weight multiplied by the correlation to a daily-rebalanced equal-weight index of the selected securities with cumulative return greater than zero). Either I managed a marginally higher return at the cost of much higher volatility and protracted drawdown, or I maintained my Sharpe ratio at the cost of much lower returns. Thus, I scrapped all of it, which was a shame as I was hoping to be able to combine the two methodologies into one system that would extend the research I previously blogged on. Instead, after scrapping it, I decided to have a look as to why I was running into the issues I was. In any case, here’s the quick demo I did. Essentially, I compared FAA with the stepwise correlation rank algorithm, without it, and the offensive EAA with and without crash protection. The results were disappointing. In short, the best default FAA variant handily outperforms any of the EAA variants. Note of warning: if you run EAA, it seems it’s unwise to do it without crash protection (aka decreasing your stake in everything but the cash/risk free asset by a proportion of the number of negative return securities). I didn’t include the defensive variant of EAA since that gives markedly lower returns. 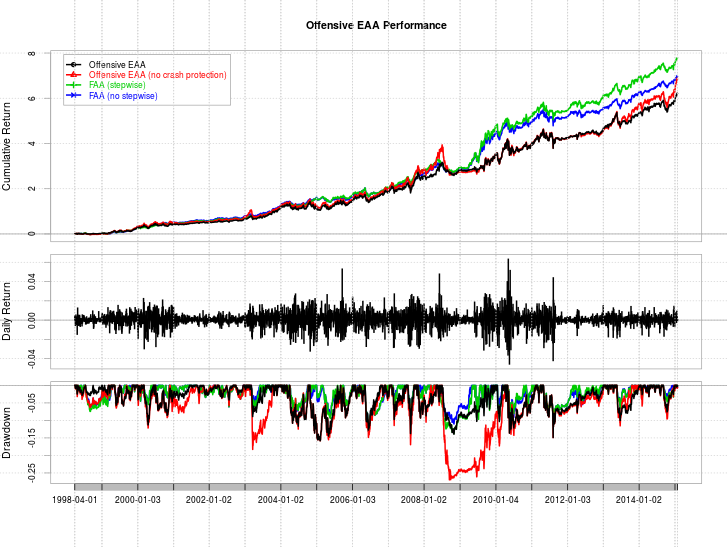 Not that this should discredit EAA, but on a whole, I feel that there should probably be a way to beat the (usually) equal-weight weighting scheme (sometimes the cash asset gets a larger value due to a negative momentum asset making it into the top assets by virtue of the rank of its volatility and correlation, and ends up getting zeroed out) that FAA employs, and that treating FAA as an asset selection mechanism as opposed to a weighting mechanism may yield some value. However, I have not yet found it myself.